The night of October 31st (our Halloween) is called in Gaelic, Oidhche Shamhna, the night before Samhain, which is the Gaelic word for November. Samhain was also the name of an ancient Celtic festival that signalled the beginning of winter. It was a time when fairies and spirits roamed and it was best to disguise yourself to avoid being harmed or snatched away by them! Gaels have many customs associated with Oidhche Shamhna. 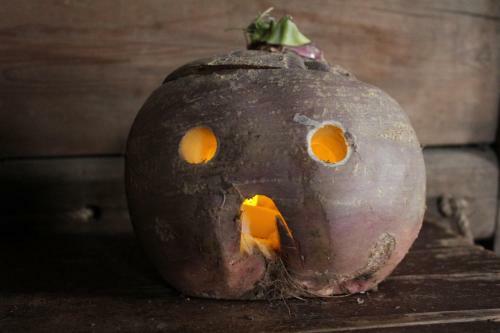 In Scotland, bonfires were lit and people carved turnips, put a candle in them and placed them in windows to scare away evil spirits. In Nova Scotia, as in Scotland, Gaels continued the tradition of visiting others in disguises. They beat on the houses with sticks, to ward away evil spirits and often recited a little poem requesting food. Do these customs remind you of any of your own Halloween customs? Probably the most commonly practiced custom among Gaels of Scotland and Nova Scotia was making and eating fuarag. Fuarag is a mixture of toasted oats and whipped cream into which was placed a ring, button, coin and a thimble. People would take a large spoonful of the fuarag and whatever item you got would tell you about your fortune in the coming year. If you got the ring, you would get married; if you got the button, you would lose money; if you got the coin, you would come into money and if you got the thimble, you would remain unmarried. Different versions of this custom appear in different regions of Nova Scotia. One version had a mother placing many buttons into the mixture and whichever child got the most buttons would be the winner. Toast oats on a baking sheet in the oven. (Toasting the oats is optional.) Whip the cream in a large bowl. Add to this the oats, ring, button, thimble coin and optional sugar. Enjoy! Watch the following video about fuarag and other ways the Gaels told the future on Halloween.